Kick off your visit on the 9th (Mon): see the interesting displays at Rosala Viking Centre and then visit a coastal fixture at Bengtskar Lighthouse. To find other places to visit, more things to do, reviews, and more tourist information, you can read our Rosala sightseeing planner. London, UK to Rosala is an approximately 11.5-hour flight. You can also drive. The time zone difference when traveling from London to Rosala is 2 hours. Traveling from London in September, expect Rosala to be slightly colder, temps between 18°C and 7°C. Wrap up your sightseeing by early afternoon on the 9th (Mon) to allow time for travel to Uusikaupunki. Start off your visit on the 10th (Tue): take in the architecture and atmosphere at Uusikaupunki Old Church, then see the interesting displays at Bonk Museum, and then examine the collection at Automobile Museum. To find maps, reviews, and more tourist information, you can read our Uusikaupunki trip maker app . Drive from Rosala to Uusikaupunki in 3.5 hours. In September, daily temperatures in Uusikaupunki can reach 18°C, while at night they dip to 7°C. Cap off your sightseeing on the 10th (Tue) early enough to travel to Naantali. Naantali is a town in south-western Finland, known as one of the most important tourist centres of the country. Popular historic sites such as St Henry's Ecumenical Art Chappel and Naantali Church are in your itinerary. 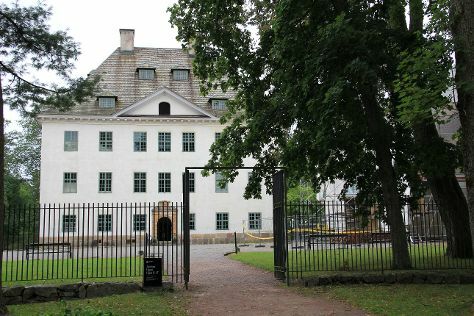 Louhisaari Manor and Kylamaki Village of Living History will appeal to museum buffs. There's still lots to do: trek along The Archipelago Trail, let little ones run wild at Adventure Park, head off the coast to Vepsa Island, and admire the masterpieces at Ett Hem Museum. To see reviews, other places to visit, more things to do, and other tourist information, read our Naantali route planner . You can drive from Uusikaupunki to Naantali in an hour. September in Naantali sees daily highs of 18°C and lows of 7°C at night. Finish up your sightseeing early on the 13th (Fri) so you can travel back home.